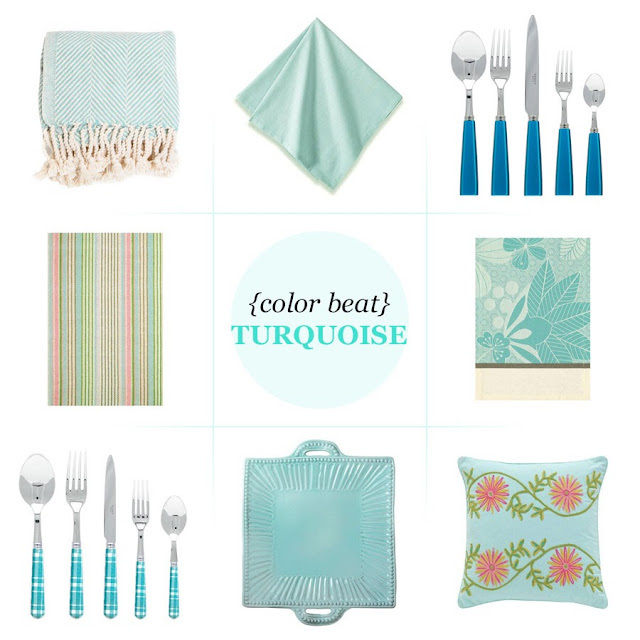 As the summer months have us dreaming of ocean breezes and dining el fresco, we're drawn to the always uplifting turquoise. The color reminds us of a perfect sunny day and instantly brightens our mood. Take a dip in this dreamy hue with a few of our favorite finds for entertaining and beyond. Pair these turquoise accents with crisp white for a decidedly summer look, then take it into the cooler months by pairing it with shades of brown or grey. Turquoise accents (left to right): Cotton Herringbone Island Blue Throw, Sonia Powder Blue Napkin, Natura Turquoise Flatware, Ana Aqua Ticking Rug, Empreintes Vegetales Curacao Placemat, Highlander Turquoise Flatware, Incanto Aqua Platter, and Edelweiss Crewel Aqua Pillow. Need even more of a turquoise fix? View more turquoise accents.